It’s not exactly the pinnacle of robotic achievement, but it is progress. And one heck of a fun demo. If you watched “The Tonight Show” with Jimmy Fallon on Friday, you might have seen it: Fallon playing beer pong against a robot. The machine is made by Boston-based startup Empire Robotics. 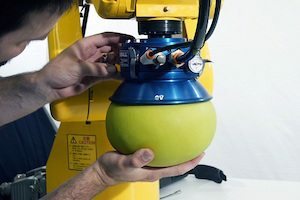 It uses a flexible, ball-shaped gripper filled with a sand-like material to pick up things. Thanks to the physics of phase transitions, pumping air into the ball makes it soften and conform to the shape of an object it wants to pick up; then pulling air out of the ball makes it harden and grip the object (in this case, a ping-pong ball). You can catch the Empire robot and co-founder Bill Culley at Robo Madness Boston on March 11. In the clip below, the robot is introduced by tech journalist Joshua Topolsky.